The Victoria Cross is Britain's highest honor for soldiers. It is not awarded very often, some estimates are around 634 compared to the Congressional Medal of Honor at an esitmated 3400 times. So for an individual to obtain one is truly an honor. But for it and its soldier to be forgotten is truly a tragedy. 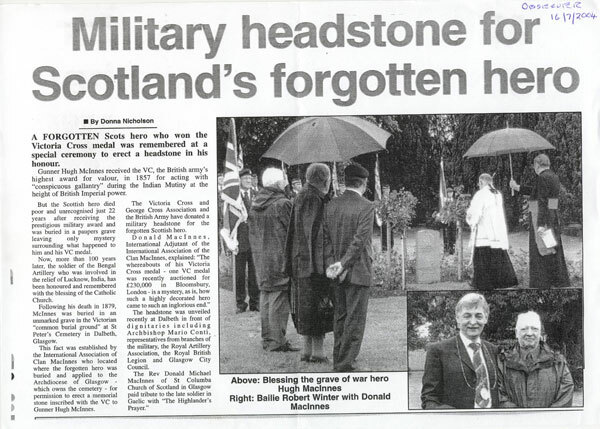 It was the work of our late Scottish Commissioner, Donald MacInnes, who discovered the soldier and his medal, and who worked to regain the recognition Hugh deserved. Donald passed away in January of 2007, but his words live on in this article published in The Highlander Magazine July/August 2005. The article is repeated below. 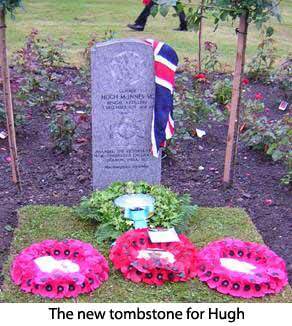 "The Victoria Cross retains a mystique that no other decoration has ever achieved. 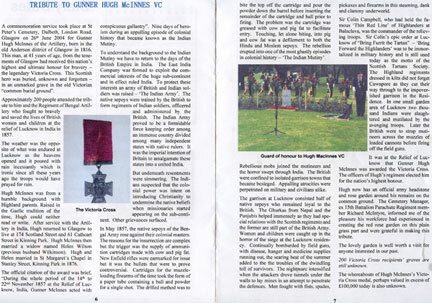 It takes precedence over all others, and the merest glimpse of that distinctive crimson ribbon on the breast of a veteran is sufficient to establish him as a military monarch in the midst of his admirers, and nothing short of a God in the eyes of school­boys throughout the world," says The Register of the Victoria Cross. When the Knights of the Garter, the Knights of the Thistle, the Knight Commanders and other honoured and decorated members of the British Commonwealth of Nations assemble at glittering occasions in the great palaces of the nations - these elite assemblies will always defer in order of precedence to a man wearing a simple cross of gun metal, with material worth a few dollars, on his breast. 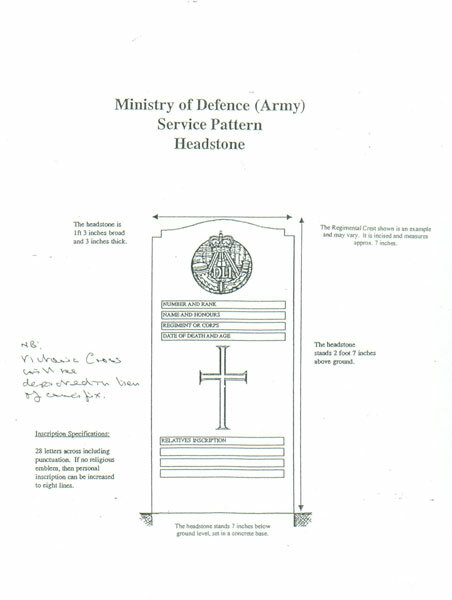 The cross is inscribed with just two words "For Valour." This medal is the legendary Victoria Cross. 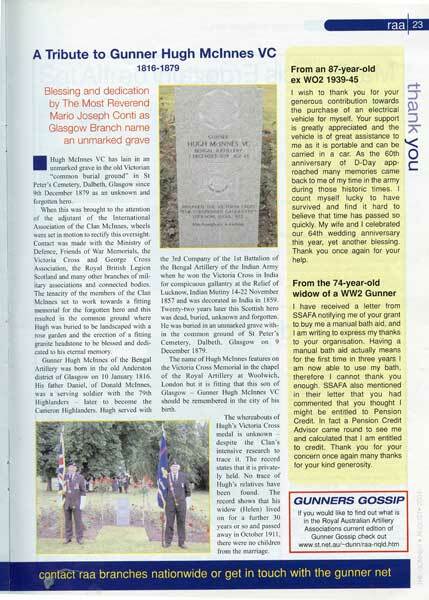 The International Association of Clan Maclnnes has finally honoured one of its own Victoria Cross heroes 125 years after his death. 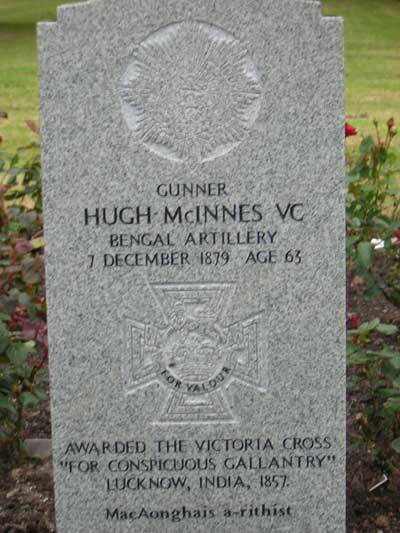 Gunner Hugh McInnes, a native of Glasgow, Scotland, won the Victoria Cross, the British Commonwealth's highest and ultimate award for bravery, at the siege of Lucknow. 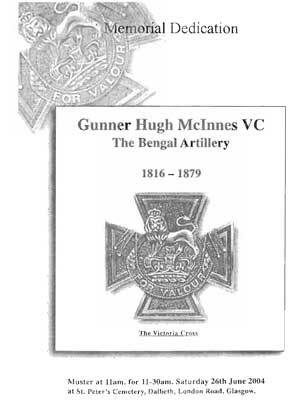 Serving as a gunner in the Bengal Artillery, the 41-year-old Glasgow Highlander displayed extraordinary heroism in fighting to free a community which for five months had been under attack from mutineers from the Indian Army and rioting mobs. In May 1857, the native sepoys of the Bengal Army rose against their colonial masters. The rebellion erupted into one of the most ghastly episodes in British colonial history "The Indian Mutiny." Rebellious mobs joined the mutineers and the horror of the Indian Mutiny swept through the country in the early summer of 1857. The British were confined to isolated garrisons that became besieged. Appalling atrocities were perpetrated on military and civilians alike - some of the most dreadful deaths were reserved for women and children. The massacre of men and about 200 women and children at Cawnpore is indescribable. Lucknow residency came under siege in the stifling heat of late June. The garrison consisted of 1,700 soldiers. Half of these numbers were native sepoys who had remained loyal to the British. This number was reduced at one point to 300 British soldiers and 300 loyal sepoys; 550 women and children were caught up in the horror of the siege. The garrison was continually bombarded with field guns looted by the insurgent sepoys and withering small fire raked the makeshift defenses day and night. Disease and hunger stalked the besieged as food and medicine ran out. The searing heat of the Indian summer added to the dwindling roll of survivors. The month passed and the exhausted men, women and children could only look forward to a terrible end. The nightmare intensified when the attackers drove tunnels under the residency in an attempt to penetrate the defences. The soldiers of the garrison encountered the mutineers head on inside the tunnels. Men fought men with fists, spades, pick­axes and firearms in this steaming, dank and clammy underworld. At home the nation waited and prayed for Lucknow. One morning in November a young Scots girl named Jessie cried out that she heard the sound of Scottish bagpipes. She was thought to be going insane. But disbelief turned to joy as the unmistakable skirl of the Highland bagpipes fell on the eager ears of the defenders Highland regiments were approaching the outskirts of Lucknow. It was at "The Relief of Lucknow" that the commander of the Highland Brigade, Sir Colin Campbell of "The Thin Red Line" fame, was to issue the epic order that was to be immortalized in military history and become the motto of The Scottish Tartans Society: "Bring Furrit the Tartan" - bring forward the Highlanders. 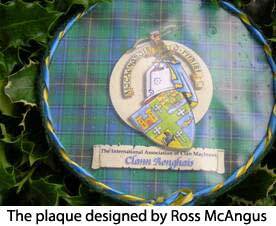 When the International Association of Clan Maclnnes learned of the fate of this kinsman and Scottish hero, they resolved to correct the situation and over the past three years have worked toward this end. 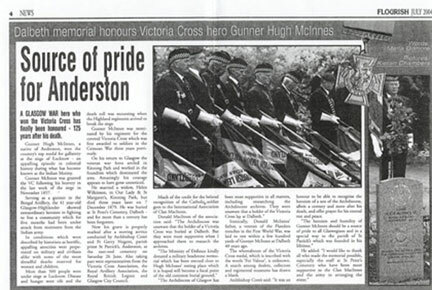 Therefore, on Saturday morning June 26, 2004, a military memorial with the insignia of the Victoria Cross, located in a specially created rose garden, was unveiled with full military hon­ours in the old Victorian "common burial ground", a pauper’s cemetery, at Dalbeth, Glasgow, to Gunner Hugh McInnes VC. 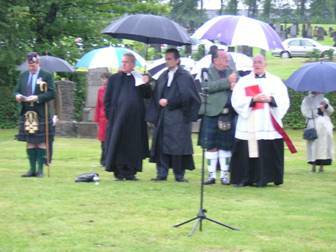 Mario Conti, the Archbishop of Glasgow, led the military service and ceremony by blessing and dedicating the memorial to Gunner Hugh McInnes VC. The Reverend Donald Michael Maclnnes of St Columba Gaelic Church of Scotland recited "The Highlander's Prayer" in his native Gaelic, a lone piper played a haunting lament and a young bugler sounded "the last post" across the silent and extensive gathering. Members of Clan MacInnes paid tribute to their forgotten kinsman and military representatives acknowledged a departed comrade-in-arms. Senior Baillie Leonard represented the Lord Provost of Glasgow and the Glasgow City Council and Lieutenant Colonel McVittie of the Argyll and Sutherland Highlanders acted as parade marshal to the various military regiments, associations and personnel. The Royal Regiment of Artillery provided the Guard of Honour and 20 standard bearers paraded regimental banners in tribute to the forgotten hero. BBC Television and the media covered the event nationally. 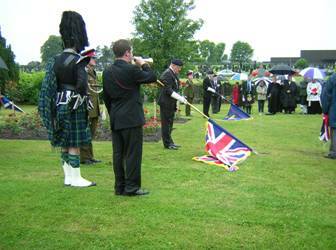 Afterward, over 100 invited guests attended a post ceremony function at the Royal British Legion, Scotland in honour of a once but no longer forgotten Scottish soldier. Left: Archbishop Marco Conti with Reverend Donald Michael MacInnes of St. Columba Church. Right: the lowering of the standards. 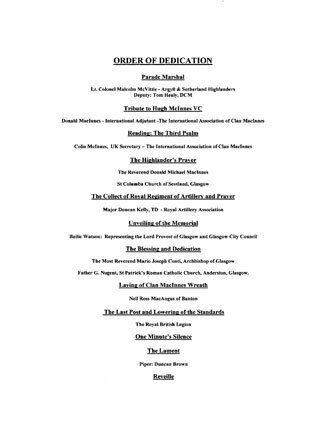 The order of the dedication. © The Observer news article July 16, 2004. © Flourish news article July 2004. © The Gunner Magazine August 2004. 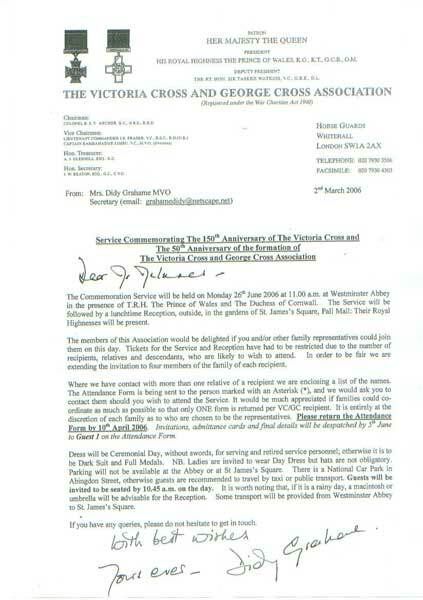 The Royal invitation to the ceremony. Here is the slide show in video format in a new window.